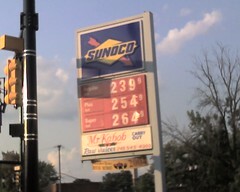 Gas Prices are pretty low right now! I cannot believe how much gas has dropped in the last few months. It’s really insane, but in a good way. I got this graph from DetroitGasPrices.com. Looks like they shot back up 10 cents in the last few days, but still. Compared to gas prices from 5 years ago, we’re right around the same area but pretty much since then it’s a much better deal. I was talking two years ago about “how low” prices had dropped but it almost peaked at a dollar less these past few weeks. I’m so glad I don’t drive far. Generally, less than a tank gets me through the week. I know everyone keeps their eyes open for good gas prices and will hit one gas station over another since it’s a few pennies different. I’m sure some people sometimes waste gas by driving a little farther. I know I’m always happy when I can save a few pennies per gallon (I usually fill up on Tuesdays since I’m usually over by some cheap stations). Here’s something to keep in mind, 6 cents more a gallon (if it’s around $3) is only a 2% difference (12 cents more a gallon is only 4%). Normally, when I eat at McDonald’s I get a number 3 meal (Quarter Pounder – no pickle, no mustard which includes a 20 oz soda and medium fry). At the McDonald’s by work (Plymouth/Beech, Redford, MI) it’s $4.77 (tax included); at the McD’s by my house (Michigan/Greenfield in Dearborn) it’s $5.36 (tax included). That’s a 59 cent difference! That’s 12% more at the more expensive McDonald’s. FYI, both the McD’s I’m referring to have been renovated in the last few years and the cheaper one has a playland. So keep in mind if your $3 gallon of gas was 12% more at a nearby location it would 36 cents more per gallon! Now it’s not cost effective for me to take the time (and gas) to drive home to save 60 cents, but maybe I should check out the other two nearby McDonald’s to see what they charge. Plus Kelly always refers to the Redoford one as an expensive one (that’s the one I say is cheap). Yes, that’s for a whole gallon!!! Ann Arbor Trail and Telegraph (Redford/Dearborn Heights, Michigan). And what’s just as important as this post is, it’s also important that it wasn’t about music or iPods or Apple. It was in Allen Park (or maybe Melvindale), MI at Allen and Outer Drive. It was in Melvindale (or Detroit) on Dix/Toledo a few blocks before it dead ends into Schaefer (south of the Rouge plant), one on each side of the road. Just in case you want some too! http://GarySaid.com/tags/gas-prices/ generated Saturday, April 20th 2019 at 8:10:15 pm EDT (in 120 queries in 0.705 seconds).